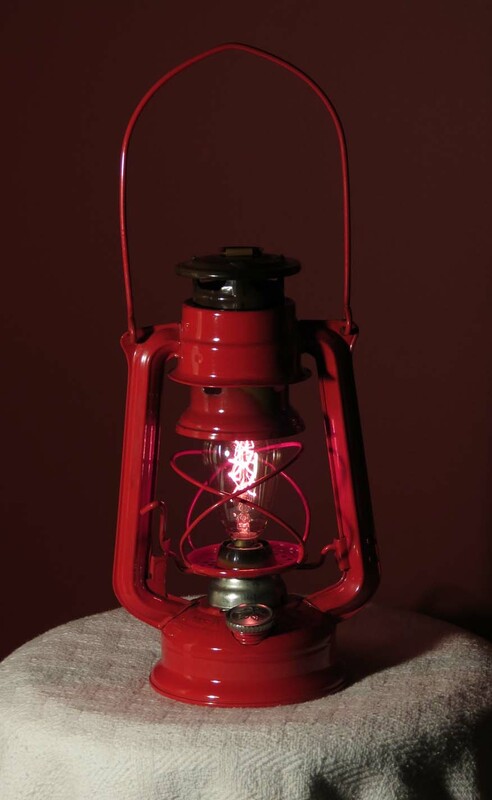 This is a small barn lantern – a Meva 863 made in Czechoslovakia. It has been thoroughly cleaned and is in great shape as it seems rarely to have been used. It has been electrified using a brass socket and 25 watt antique reproduction light amber filament bulb. The original glass globe has been removed to make room for the new bulb. Size 5″ x 5″ x 11″ (12cm x 12cm x 28cm) Not including the handle. All electrical parts are new. Supplied with a candelabra base socket and approximately 6 feet of silver vinyl cord with an in-line toggle switch. The 25 watt filament bulb is included. Please be sure to read the ‘Safety Information’ before purchase.